Chiang Mai is located in the northern part of Thailand, its capital is the city of the same name. Chiang Mai is the second largest cultural center of the country after Bangkok. There is a wide number of fascinating historical sites there. The picturesque province with the colorful capitaland many charming towns attracts fans of excursion tourism. There are no beaches in the province, and therefore travelers can diversify leisure only by visiting outstanding cultural and entertainment venues. 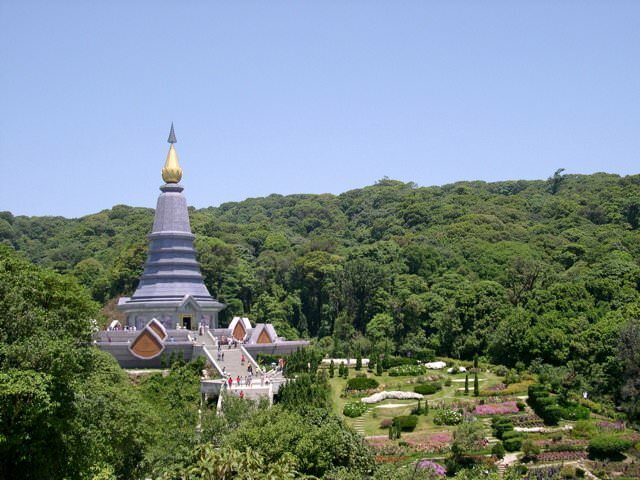 The rich excursion program can be offered by Chiang Mai; one of the main symbols of the capital is Wat Phrathat Doi Suthep . It was founded in 1383; it is one of the oldest temples in Thailand. The walls of the temple house priceless religious relics. The surrounding area is decorated with old statues and original landscape compositions. Excursions fans should definitely look into the Museum of World Insects and Natural Wonders. It is considered one of the most unusual cultural centers in Asia; the museum's collection is very interesting and diverse. The night market in Chiang Mai located near the historic district is of particular interest. There you can buy a lot of interesting handicrafts and art objects, jewelry and other national souvenirs. Outside the capital, there is also a decent selection of interesting places to visit. Chiang Dao town is ideal for hiking, as there are lots of interesting natural attractions and hundreds of popular hiking trails in it. There is the picturesque Doi Chiang Dao mountain in the immediate vicinity of the town attracting numerous climbers. There is a huge number of beautiful rivers, hot springs and mysterious caves at its foothills. 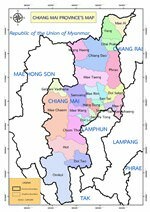 Thaton is perfect to explore the culture and traditions of the indigenous population. Local residents have cherished their amazing traditions for many hundreds of years; indigenous people are happy to represent their culture to foreign guests. Among the natural attractions, Doi Inthanon reserve featuring the mountain with the same name deserves special attention. It’s noteworthy that there are several hotels and resorts, so the tourists have an opportunity to stay in scenic locations for a few days. Wiang Kum Kam , the former capital of the Lanna kingdom, is ideal for exploring the historical sites. Despite the fact that the old city has been in ruins for more than 700 years, its territory features interesting buildings, including ruins of ancient temples and places of worship, luxurious palaces and statues. 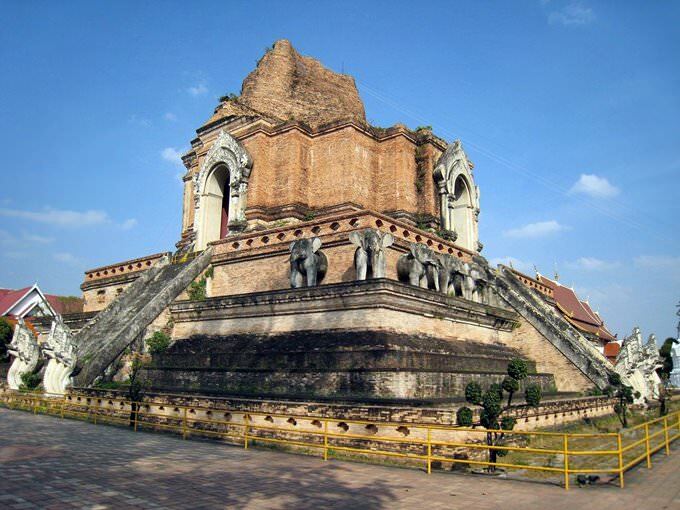 Chiang Mai province can safely be called the leader of the country in the number of priceless historical monuments. Chiang Mai never ceases to attract visitors with its gastronomic traditions. Restaurants of Chiang Mai are not inferior to the best restaurants of the capital. There are many excellent vegetarian restaurants and restaurants that specialize in seafood dishes. The region is also suitable for the acquaintance with the classical Thai cuisine. In recent years, many restaurants serving European cuisine have also appeared in the region. A visit to the Sunday market is something that travelers shouldn’t neglect. The market opens weekly in Chiang Mai. Sellers and artisans from the nearby regions bring their wares to the market. It is a great place to purchase various interesting souvenirs, inexpensive clothes, jewelry in the national style, and artworks. In some outlets, it is possible to find interesting antique items. Of course, the Sunday market has a rich selection of food. Visitors will easily find popular national delicacies and traditional street food that is cooked in open air cafes. Street musicians frequently perform on the market, so visitors can often become witnesses of interesting dancing and music performances or simply admire artists dressed in beautiful national costumes. This guide to iconic landmarks and sights of Chiang Mai Region is protected by the copyright law. You can re-publish this content with mandatory attribution: direct and active hyperlink to www.orangesmile.com. All about Chiang Mai Region, Thailand - sightseeings, attractions, touristic spots, architecture, history, culture and cuisine. Prepare your trip together with OrangeSmile.com - find out the 'must see' things in Chiang Mai Region, which places to visit, which excursions to take, where the breathtaking views are waiting for you. Planning your trip with this travel guide will help your to get the most out of Chiang Mai Region in few days.